In physics, leverage denotes the use of a lever and a small amount of force to lift a heavy object. Likewise in business, leverage refers to the use of a relatively small investment or a small amount of debt to achieve greater profits. That is, leverage is the use of assets and liabilities to boost profits while balancing the risks involved. There are two types of leverage, operating and financial. Operating leverage refers to the use of fixed costs in a company's earnings stream to magnify operating profits. Financial leverage, on the other hand, results from the use of debt and preferred stock to increase stockholder earnings. Although both types of leverage involve a certain amount of risk, they can bring about significant benefits with little investment when successfully implemented. Operating leverage is the extent to which a firm uses fixed costs in producing its goods or offering its services. Fixed costs include advertising expenses, administrative costs, equipment and technology, depreciation, and taxes, but not interest on debt, which is part of financial leverage. By using fixed production costs, a company can increase its profits. If a company has a large percentage of fixed costs, it has a high degree of operating leverage. Automated and high-tech companies, utility companies, and airlines generally have high degrees of operating leverage. As an illustration of operating leverage, assume two firms, A and B, produce and sell widgets. Firm A uses a highly automated production process with robotic machines, whereas firm B assembles the widgets using primarily semiskilled labor. Table 1 shows both firm's operating cost structures. Highly automated firm A has fixed costs of $35,000 per year and variable costs of only $1.00 per unit, whereas labor-intensive firm B has fixed costs of only $15,000 per year, but its variable cost per unit is much higher at $3.00 per unit. Both firms produce and sell 10,000 widgets per year at a price of $5.00 per widget. Operating leverage is a double-edged sword, however. If firm A's sales decrease by I percent, its profits will decrease by more than I percent, too. Hence, the degree of operating leverage shows the responsiveness of profits to a given change in sales. same percentage change in shareholder earnings. For example, a 5 percent increase in operating profit will result in a 5 percent increase in shareholder earnings. If a company is financed with debt or is "leveraged," however, its shareholder earnings will become more sensitive to changes in operating profit. Hence, a 5 percent increase in operating profits will result in a much higher increase in stockholder earnings. Nevertheless, financial leveraging makes companies equally susceptible to greater decreases in stockholder earnings if operating profits drop. For example, recall the two firms, A and B. At production levels of 10,000 widgets, they both had operating earnings (profits) of $5,000. In addition, assume that both firms have total assets of $40,000. Table 2 shows how the $40,000 of assets are financed for both firms. Firm A is financed with $10,000 of debt which carries an annual interest cost of 8 percent, and $30,000 of stockholders' equity (3,000 shares), firm B is financed entirely with $40,000 of stockholders' equity (4,000 shares). Firm A is leveraged and uses some debt to finance its assets, which can increase earnings per share but also risk. 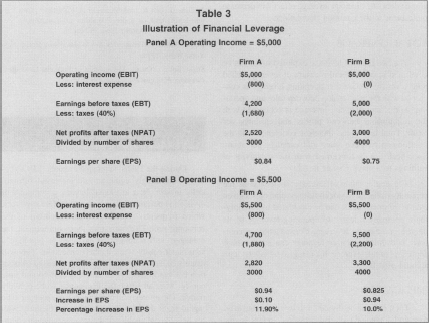 Table 3 shows the results of financial leverage on the firm's earnings. Panel A shows that as a result of the $800 interest expense from the debt ($10,000 X. 08 = $800), firm A's earnings per share are lower than firm B's. Because firm A is financially leveraged, however, an increase in profits will result in a greater increase in stock earnings. Panel B shows the results of a 10 percent increase in profits for both firms. Firm A's stockholder earnings increased from $0.84 to $0.94, an 11.9 percent increase, while firm B's stockholder earnings increased from $0.75 to $0.825, or 10 percent, the same as the increase in profits. Companies with significant amounts of debt in contrast with their assets are referred to as being highly leveraged and their shareholder earnings are more unpredictable than those for companies with less debt. Lenders and financial analysts often measure a company's degree of financial leverage using the ratio of interest payments to operating profit. From the perspective of shareholders, financing using debt is the riskiest, because companies must make interest and principal payments on debt as part of their contract with their lenders, but they need not pay preferred stock dividends if their earnings are low. Nevertheless, financing with preferred stock will have the same kind of leveraging effect as debt financing as illustrated above. Firms that use financial leverage run the risk that their operating income will be insufficient to cover the fixed charges on debt and/or preferred stock financing. Financial leverage can become especially burdensome during an economic downturn. Even if a company has sufficient earnings to cover its fixed financial costs, its returns could be decreased during economically difficult times due to shareholders' residual claims to dividends. Generally, if a company's return on assets (profits. total assets) is greater than the pretax cost of debt (interest percentage), the financial leverage effect will be favorable. The opposite, of course, is also true: if a company's return on assets is less than its interest cost of debt, the financial leverage effect will decrease the returns to the common shareholders. The two types of leverage explored so far can be combined into an overall measure of leverage called total leverage. Recall that operating leverage is concerned with the relationship between sales and operating profits, and financial leverage is concerned with the relationship between profits and earnings per share. Total leverage is therefore concerned with the relationship between sales and earnings per share. Specifically, it is concerned with the sensitivity of earnings to a given change in sales. The degree of total leverage is defined as the percentage change in stockholder earnings for a given change in sales, and it can be calculated by multiplying a company's degree of operating leverage by its degree of financial leverage. Consequently, a company with little operating leverage can attain a high degree of total leverage by using a relatively high amount of debt. Total risk can be divided into two parts: business risk and financial risk. Business risk refers to the stability of a company's assets if it uses no debt or preferred stock financing. Business risk stems from the unpredictable nature of doing business, i.e., the unpredictability of consumer demand for products and services. As a result, it also involves the uncertainty of long-term profitability. When a company uses debt or preferred stock financing, additional risk—financial risk—is placed on the company's common shareholders. They demand a higher expected return for assuming this additional risk, which in turn, raises a company's costs. Consequently, companies with high degrees of business risk tend to be financed with relatively low amounts of debt. The opposite also holds: companies with low amounts of business risk can afford to use more debt financing while keeping total risk at tolerable levels. Moreover, using debt as leverage is a successful tool during periods of inflation. Debt fails, however, to provide leverage during periods of deflation, such as the period during the late 1990s brought on by the Asian financial crisis. Brigham, Eugene F. Fundamentals of Financial Management. Fort Worth, TX: Dryden Press, 1995. "Choosing the Right Mixture." Economist, 27 February 1999, 71. Dugan, Michael T., and Keith A. Shriver. "An Empirical Comparison of Alternative Methods for Estimating the Degree of Operating Leverage." Financial Review, May 1992, 309-21. Jaedicke, Robert K., and Alexander A. Robichek. "Cost-Volume-Profit Analysis under Conditions of Uncertainty." Accounting Review, October 1964, 917-26. Krefetz, Gerald. Leverage: The Key to Multiplying Money. New York: Wiley, 1988. Shalit, Sol S. "On the Mathematics of Financial Leverage." Financial Management, spring 1975, 57-66.
it lacks substance and is low in content.i reserve to comment the specific areas in the article poorly covered to some time later.